It can be difficult to put into words just how much you love your dog. The pure joy they inject into our lives can elevate even the most everyday moments into something worth telling everybody about. 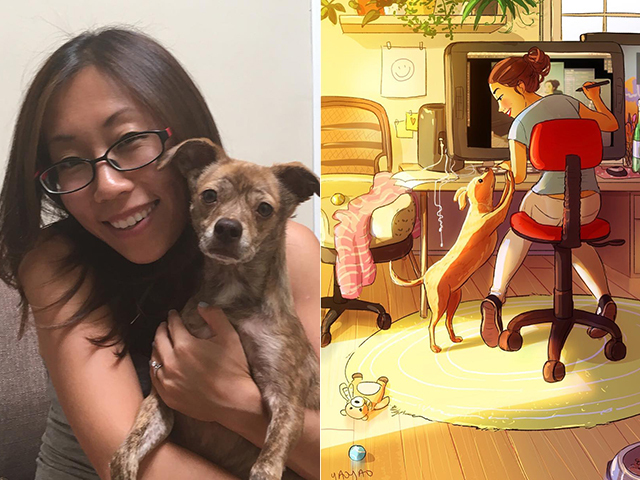 Los Angeles based artist Yaoyao Ma Van As tells the story of her and her beloved pooch in incredible illustrations on Instagram. The cute, colorful pictures are guaranteed to give you warm, fuzzy feelings when you see yourself and your favorite companion in the totally relatable day-to-day situations Ma Van As illustrates. Ma Van As tells a story that many of us are familiar with. The ups and downs of living a life shared with a dog. Many of her drawings are of moments we may take for granted, or even consider a low point in our day when we’re experiencing them. But these are also the times we tend to miss when our dogs have left us. She shows us these moments in a way that make us wistful, even if your dog was just nosing you awake a few hours ago. Ma Van As may now be best known for the work she posts on Instagram, but she has also worked for Disney TV Animation, Rick & Morty, and Warner Brothers Animation, among others. Parker is a Chihuahua/Cocker Spaniel mix that was adopted four years ago. He doesn’t appear in every picture, but he adds something wonderful when he does. Yaoyao Ma Van As’ work is available to buy in prints! You can buy many of these photos and more online at her INPRNT store. Follow her on Instagram to see more of her work!